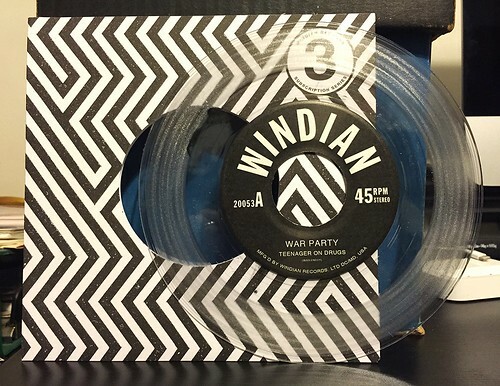 Round five of the Windian Singles Series #3 brings us War Party. I think that some folks would probably dismiss this as a bit gimmicky, but I really like this 7". It may be my favorite of the bunch when it comes right down to it. The A-side "Teenager On Drugs" is a straight up 50's style doo wop rocker. It's not so much an homage or an interpretation of a doo wop song, so in that way it differs quite a bit from what Mark Sultan is doing. This is a tried and true formula with the soaring backing harmonies and storytelling lead vocals that you'd expect from the genre. It's just such a fun and refreshing thing to hear these days. Then the B-side "D.R.U.N.K." flips everything on its head and is completely different from the song that preceded it. With its searing organ the song reminds me a bit of "Gimme Some Lovin'" by Spencer Davis Group, though it's not quite that triumphant. It does bring War Party into the 60's and shows off a dirtier rock vibe than they were showing on "Teenager On Drugs." I think it's impressive to hop from one sound to the other so effortlessly and I really dig this record.